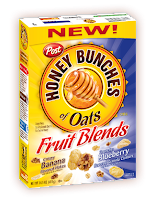 Honey Bunches of Oats - Honey Roasted now with more Granola bunches!! It has 10 grams Whole Grain.It has 4 nutritious grains-Wheat, Oat, Corn, and Rice. And now they have created Fruit Blends. 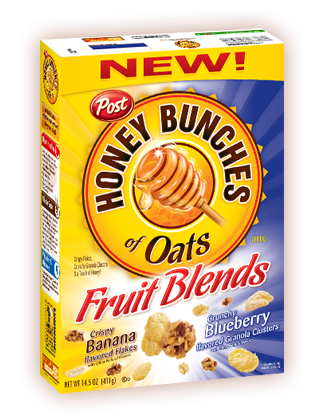 Honey Bunches of Oats is available in Honey Roasted, Almonds, Strawberries, Cinnamon Bunches, Vanilla Bunches, Pecan Bunches, Raisin Medley, Fruit Blends, and Just Bunches-Honey Roasted. My thoughts-I like Honey Bunches of Oats. I had never tried it before. I had seen the cute commercials with the employees talking about it. And I really like the Fruit Blends. This giveaway ends 6/28/2012 at 8 am. 1 winner will be randomly selected. The winner will have 24 hours to claim their prize. Please leave your email in the comment. US only. Good Luck. ***Disclosure-Post provided a free sample to review. All opinions expressed are my own. I follow Honey Bunches of Oats under the username likwan. I let Honey Bunches of Oats on Facebook know that you sent me at https://www.facebook.com/honeybunchesofoats/posts/10150996160602528. I tweeted the requested message on Twitter at https://twitter.com/likwan/status/218327619005976576.